I am having a love / hate relationship with Siri (the IPhone 4S built-in personal assistant), who genuinely TRIES to help me, but we seem to be having communication problems. Like I need someone else in my life with whom I can’t seem to make myself understood. 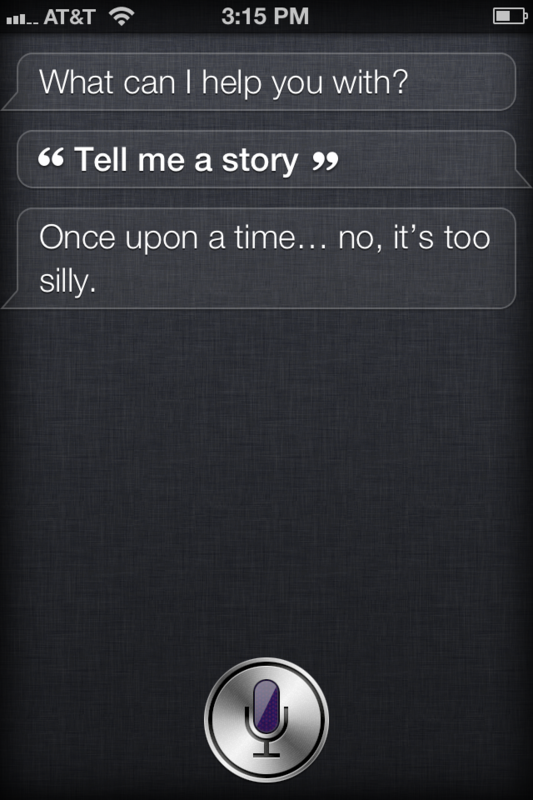 I was feeling a little snoozy later on and asked her to tell me a story – and she became delightfully coy. 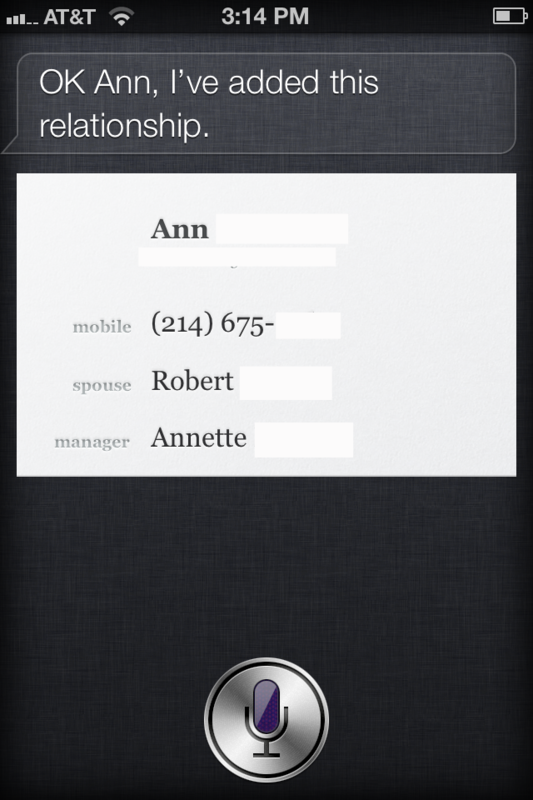 Determined to sort out the misunderstanding, I pressed the button to call Siri again and informed her that “Annette is NOT my Manager.” She had the nerve to tell me she cannot delete relationships for me. “Well, then, don’t mislabel them,” I snapped. At my phone. “I’m sorry, I don’t understand,” Siri responded demurely. Siri was able to tell me how many calories dinner was last night, but shied away from telling me where I could hide a dead body. (I was feeling inquisitive.) She DID graciously show me several businesses in my area that have the word “Hide” in them. Asking where to “dump” a dead body resulted in no nearby dumps. Oh, well. At least I know if I am ever in need of such a location, (which I have no immediate plans to require), I am on my own. Or maybe my Manager/Assistant will help me out. After all, what are mother’s for? “What suit?” I asked, perplexed. “I don’t know what you mean by “What seat?” the minx responded. So I have no idea who is going to win the Super Bowl, the suit, or the seat. 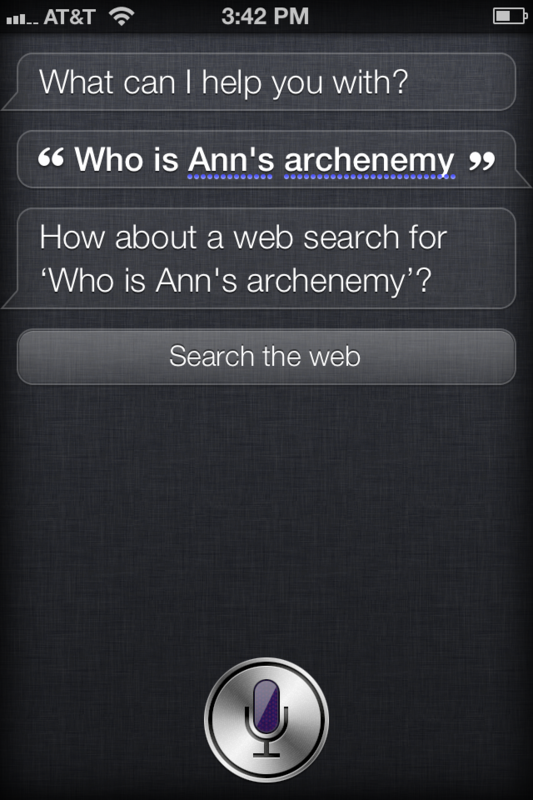 But I think I know who my arch enemy is. Yes, Siri. Be my guest. Thanks! I looked at the other English options, but am a little afraid of what I would think if she understands my fake Australian accent or fake British accent better than my good ole’ Texas accent. (Which is minimal, I assure you.) I will definitely be checking in for assistance! I can think of so many uses for this gadget… drop it from a ferry (to see how deep the water is), place it in a pan with your eggs (to see when they’re done), ritual burial (for future generations to find & ponder). Guess this is why I’m not allowed an iPhone! All excellent uses for the object in question. We’ll see how long before I choose one of your options. Oh now THAT was funny!!!!! XO! Oh, dear. I’ve been wanting a Wii, but really don’t need any more “cute” technology. Maybe I’ll re-think.